I “commited” to a release date, November 3rd, and the game isn’t ready yet. I would like to apologize for this, as well as taking so long to offer an explanation and a new date. 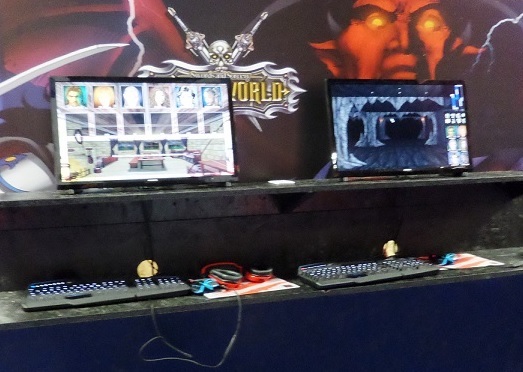 I took part in Paris Games Week which took place from Oct 28th to Nov 1st. My plan was to have the game all set before it starts, but the localization was a tougher nut to crack than I had hoped and it caused some bugs that made even an English only release… Well not impossible but not good either. I hoped to be able to finish during evenings after the convention but those things are more exhausting than I remembered… Or I’m getting old? Nah, that’s not it. On top of that player feedback from the event uncovered some features that really need to be added before release. A solid tutorial is one, and there are a few others. Quite simply, if I (or the volunteers, Jason and Dimitri, that were helping me out) weren’t there to explain the game to newcomers I would find the game screen changed and no one there playing. Ragequit. On the other hand with a quick introduction many people really got into it, and that even includes quite a few youngsters I wouldn’t have suspected could find an interest in this type of game. That’s all good news, but it requires some extra work. A few more weeks. I hope to finish before November ends, but I’d rather not “commit” to it. I hate not meeting deadlines and they’re so hard to evaluate. I captured some footage of SSUDE players at Paris Games Week. It took a bit of time to edit and blur the kids’ faces, as promised to the parents who gave me permission to film. Hopefully the announcement trailer is to your liking! Previous versions of Swords and Sorcery – Underworld had very basic character creation and levelling systems. They were in fact very close to Might and Magic – the Secret of the Inner Sanctum (Book I). Not entirely the same, but close. You had to roll for attributes. New levels earned you fixed and randomized extra points for each attribute (MMI attributes did not evolve with new levels). Underworld Definitive Edition changes a bit in that respect. Each character starts with a fixed number of points for each attribute (how many depends on class). You have a pool of six points to distribute and with each new level you will have 3 more. Skills are learned automatically at the corresponding level. In the following video you can see a party being created from scratch and in the second part all characters earning level 9 (4:50). Several characters earn skills at that level. Sovereign will be very similar, but the number of points will differ and you can choose to invest in skill points as well. Those skill points can be used to learn from teachers accross the world. In my previous entry I mentionned that weapons no longer added damage points to an existing score, but multiplied it. This works because base attributes are capped at 20. So multiplying that by 5, 10 or even 20 gives adequate results. Of course a x10 or x20 weapon will be rare and its requirements will make it unuseable by a low-level character. Weapons also have a minimum strength requirement. Strength determines damage dealt in melee. It will be multiplied by the weapon’s coefficient to determine the melee score. If the character has two weapons (ambidextria) the first weapon’s coefficient is applied to base strength, then the same with the second weapon. The three values (base strength + weapon 1 bonus + weapon 2 bonus) determines the melee score. Endurance determines how many hit points the character will earn at each level. During character creation HP=endurance. When levelling however Luck will also come into play (+random(luck)-4). Luck can turn out a negative score that will reduce HP earned but in case of a negative result it is changed to 1. Accuracy determines the chance to hit with both melee and ranged attacks. With luck it is checked against the monster’s accuracy and luck. It also determines damage dealt with ranged attacks. Strength still plays a part in that in the sense that the ranged weapon has a minimum strength requirement that is correlated with the weapon’s efficiency (most of the time). Luck intervenes here as well, adding damage exactly the same way it adds HPs earned when levelling. Spirit determines proficiency in Priest spells. It determines how many HP a healing spell recovers and how much damage an offensive spell inflicts. The same luck check is applied here as well. Intelligence is to Sorcerers what Spirit is to Priests. Luck intervenes in the same way. A monster’s intelligence (and luck) will also determine whether they spot a Rogue after a stealth attack. Luck is very important for beginning characters because random(luck)-4 can give negative results and starting attributes like strength have but a few points. It is also important because it plays a part in just about all checks. Accross the board, the number of times Luck will give an extra edge or penalty like extra damage, HP and SP during levelling, or causes a miss or hit really adds up. As the character progresses however the ratio luck to primary statistic lessens. My next update will be about items, inventory and shops. Thanks for reading! [Edit] – Following discussions with players of the previous version, I made various changes to the screen layout. Clutteredness is out. All enemies now appear on screen. First of all, there are portraits. These are visible throughout the game but in combat there are a couple things to take note of. They are layed out in their actual combat positions. There are three rows of two, which represents their actual position in combat. Therefore the first two are most exposed. Characters (and monsters) are grayed out when out of melee range. (It does NOT mean they are inactive, nor does the highlighting indicate which character/monster is up). This allows for many things, including tactical positionning options. These include: join or leave melee, order everyone forward or to retreat, or move to the front. there is also the protect option (given the character carries a shield) which allows him or her to set themselves alongside or in front of a companion and physically “share their armor”. They effectively change position in the roster. Monsters can have similar behavior. The combat log now appears in real time in the top left corner. This allows for much quicker combat since there is no longer a need for a pause to allow players to follow friendly and enemy actions. All options appear in the bottom row and can be clicked or activated with their keyboard shortcuts (those appear on the left when hovered). Several actions are unlocked later with the earning of new levels. Naturally, spell casters are rewarded with new spells. Ambidextria allows Knights and Rogues to use two 1H weapons. Stun allows the rogue to immobilize a foe for some time (how many rounds depends on an accuracy and luck versus the monster’s endurance and luck check). Burst allows the archer to shoot three arrows simultaneously (with damage per shot reduced by 25%). Later, Barrage allows the archer to shoot all visible targets (up to 10) with a 50% damage score. Berserk allows the Knight to hit all enemies in melee with a loss of 50% of his/her own life bar. Bleed allows the Rogue to inflict cumulative damage over time, but you’ll need a high level for this one. Powerhouse allows the Knight to replace 1H weapons with 2H weapons. Meaning potentially two 2H if he/she chooses to not carry a shield. To make this work better, I redesigned both the monster and item database. Monsters now have the same attributes as characters. Some attributes like endurance, spirit, intelligence and luck are used in different checks, allowing for much more variety of resistances and weaknesses. This info can be collected with a spell called Read Mind that’ll help you figure out how to defeat the tougher enemies in later stages of the game. Another example is the Rogue no longer systematically leaves stealth mode after an attack. An accuracy and luck versus intelligence and luck check determines whether he/she remains unseen or is spotted by the target. If the target is killed by an assassination, the Rogue will remain unseen no matter what. Weapons now have a penetration and minimum strength score. I added this mainly to accomodate the Archer. The Archer’s damage now exclusively depends on his/her accuracy and luck (to a lesser extent of course), regardless of strength. But to use a more powerful weapon, the Archer will have to match the weapon’s minimum strength. Penetration is deducted from the target’s armor score before determining final damage. While this helps balance the Archer’s contribution to the group, it works the same for melee weapons (whose damage scores are determined by strength.) But bows tend to have higher penetration scores than swords or daggers. To further accomodate this system, I changed the way weapons work as well. They no longer add to the character’s damage score but multiply it (+0.20*Base Melee, +5.5*Base Ranged…). The weakest ranged weapon (sling) adds 20% to base ranged damage (the accuracy score). The most powerful melee and ranged weapons exceed 10*. Scores of armor and special items have attribute bonuses and many can be enchanted later in the game. I’ll explain in my next entry how the entirely new character creation and development system works in this context.